31-Oct-2011 -- Confluence #1/2 on this trip, visited on 31 October 2011. We bagged this Confluence in the late morning. We were enroute through the Moroccan desert close to the disputed border to Algeria from Erg Chebbi in the East to the Atlantic coast near Tan Tan. After refuelling at Assa we left the asphalt road 40 km south of Assa and discovered that there is a new road under constuction which will connect Assa and Tan Tan via Messeied in near future. Currently the track is a real mess since heavy trucks are crisscrossing the whole area and turning the ground to fesh-fesh, a powder-like dust which you cant't keep out of the car and which soon covers everything. The good thing was that my initial concerns about landmines, which are known to be laid near the border to the former Spanish Western Sahara were obviously obsolete due to the contruction activities. 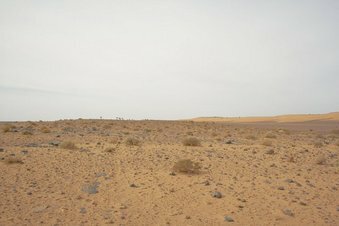 So we had no fear to leave the tracks for 20 km to reach the spot in the vicinity of a small ridge covered with some rare sand in this stony part of the sahara. The only inhabitant we saw was a baby Desert Agama (Trapelus sp. ), a lizard, still too stiff to move away.